1409 West Pender Place Towers/Condos, one of the last new projects in Vancouver’s luxury waterfront neighbourhood, West Pender Place is situated on Pender and Broughton. Nearly every interior space is different.Its amenities will be a roof terrace, meeting room, gym, indoor pool and lounge. 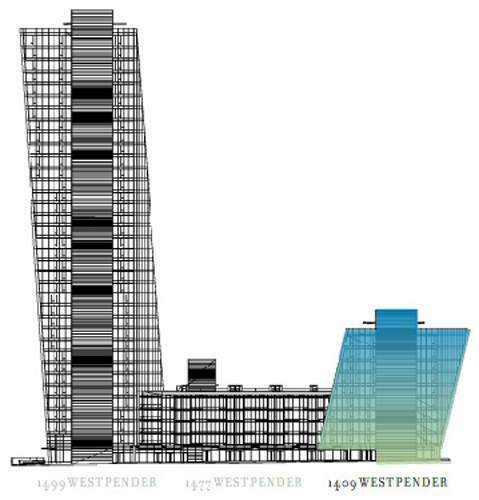 1409 West Pender will have a tower 34 storey’s to the west and a 15 storey to the east with 5 storeys in the middle. This luxury residential high rise project is located in the upscale Coal Harbour neighbourhood of downtown Vancouver.